Square / Rectangle Raised Beds 3'x12'x22", 3'x6'x11" and 3'x3'x16.5"
Square and rectangle raised beds are easy to assemble and a popular choice for growing flowers, herbs and vegetables in traditional row gardens. Rectangular raised beds are simple to plan and work with, especially for beginners, and the ideal shape for square foot gardening. 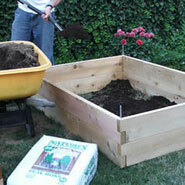 Our raised bed kits make building a garden easy, whether you’re just starting out or have been gardening for years. You can plan a garden of almost any shape or size and build it easily with our simple tool-free kits. Mix and match planter shapes to fit any gardening need. 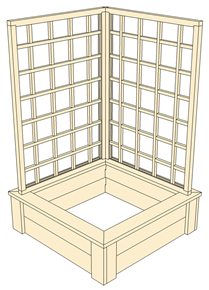 Add trellises to support climbing plants such beans and peas, cucumbers and tomatoes. Optional planter bottoms provide drainage on hard surfaces, so you can build full-size vegetable gardens on rooftops, driveways and parking lots. Trim pack options provide a more finished look and added durability. Raised bed planters are made from durable cedar protected by a non-toxic waterproof sealant that is safe for vegetable gardening. Raised beds are available in hundreds of shapes and sizes—many more than listed above. If you don’t see what you’re looking for, just ask. We'll help you build the perfect garden.